“Public schools belong to everyone in a community. So everyone who’s present in that community should contribute their fair share,” Jenna Styles Spooner, a kindergarten teacher at Riverview School of Excellence said at a rally kicking off the SPFT’s contract campaign. 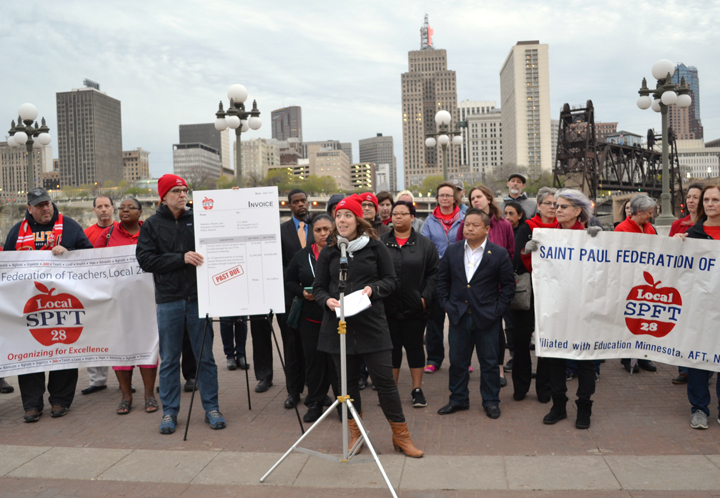 Anticipating negotiations with a school district that seems perpetually short on resources, St. Paul teachers launched their contract campaign today – Tax Day – by calling on the city’s wealthiest corporations to pay their fair share toward local public schools. St. Paul Federation of Teachers Local 28 kicked off its contract campaign early this morning with a rally outside U.S. Bank’s operations center. Located across the Mississippi River from downtown St. Paul, the site was developed by the city using tax-increment financing – an arrangement that exempts U.S. Bank from paying about $1 million in property taxes to the St. Paul Public Schools annually, Local 28 President Denise Rodriguez told about 50 members and supporters at the rally. SPFT President Denise Rodriguez delivers an invoice to U.S. Bank CEO Richard Davis. Rodriguez and other teachers called out Wells Fargo and Ecolab for dodging their fair share in local taxes too, but big banks and corporations, they added, share responsibility for the district’s budget shortfalls with huge, tax-exempt organizations – hospitals and private colleges – that sit on massive endowments or foundations. 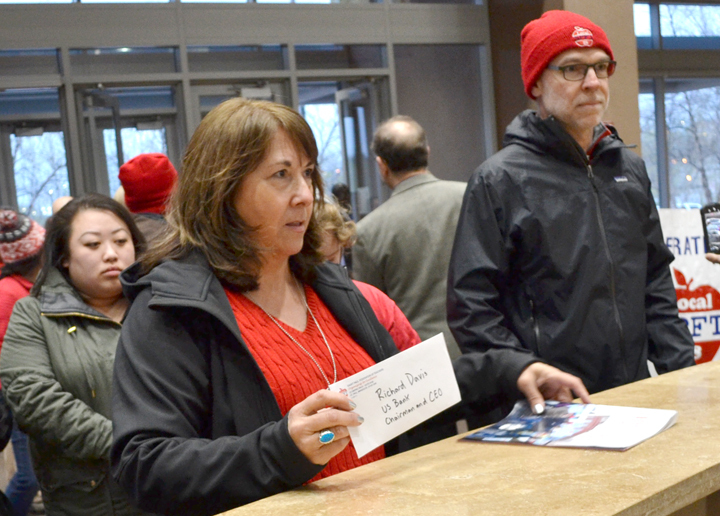 After the rally, Rodriguez and other teachers entered the operations center to deliver an invoice to U.S. Bank seeking the funds it’s avoided paying into the St. Paul Public Schools.